September 04, 2018 / Valerie Wilson Travel, Inc.
What is a typical day like in the life of a suite? My day starts with a spectacular oceanfront sunrise – trust me, this breathtaking view will make anyone a morning person! Once the morning rolls in, it’s time to get me ready for the day. At 7,725 square feet (718 square meters), I adhere to an extensive beauty routine - I need to look perfect when my guests arrive! Housekeeping, gives me the royal treatment, cleaning and primping all five of my bedroom options and five-and-a-half baths, which they restock with fragrant ESPA bath products. The technology team then comes by to ensure my advanced Crestron technology is fully operating and that my guests will be able to control my lighting, temperature, television, and sound with the touch of an iPad. I have a gorgeous and aromatic living wall on my pool deck, which is also home to my salt water swimming pool, summer kitchen, and lounge area, so the diligent landscapers and pool attendants preen, clean and beautify this space – but it can be pretty distracting, my ocean views from the 46th floor are unparalleled! My kitchen and entertainment bar are then fully stocked by the food & beverage team with anything my incoming guests having specifically requested. Once the executive housekeeper has given me the final once over, my friend and Penthouse Butler comes to ensure I’m completely camera ready for the main event – the arrival of my new guests! The Butler will be the point of contact for my guests and will guarantee that I am in pristine condition at all times. What was your favorite feedback or comment received from past guests? I have received wonderful feedback on my artistic vibe. Most recently, during Miami’s world-renowned Art Basel event, I was able to offer my guests a private Art Basel experience before they even left for the art events. My penthouse features an extensive art collection including photographs by Peter Lik , housed in my foyer. Additionally, commissioned art pieces by contemporary artist Klara Chavarria Kepfer live in the entrance, there are two stunning Moura Starr floating chandeliers above my dining room table, two paintings by internationally renowned artist Jamali are featured in the living room, Israeli artist Nathan Brusky’s work can be found in the dining and media rooms, and gorgeous, modern statues are displayed in the grand entrance and outdoor pool area. Everywhere you turn, you’ll find enchanting works of art - I am practically an art museum myself! What is your biggest indulgence in captivating new guests? Acqualina is a world-renowned, five-star resort, receiving top honors and accolades year after year and I am so proud to be part of this exceptional hotel. Acqualina is the only resort of its kind to be fully open to the sea, free of any barriers, making the view from my 1,990-square foot wraparound terrace one of the most spectacular in all of Miami. 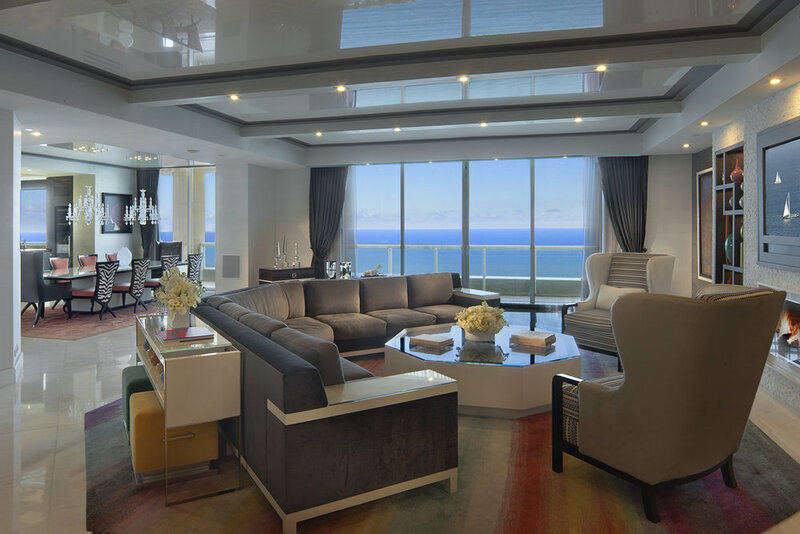 From the moment my guests arrive, they are encouraged to unwind and drink in the view as the Penthouse Butler unpacks for them and makes any arrangements they may request. I must say, I am also perfect for multigenerational families. Those who prefer a little space can occupy my private cabana guest house, while other family members who wish to stay closer together can remain in the main quarters. The salt water swimming pool on the terrace and the media room are excellent sources of entertainment for the whole family to enjoy together. What would be your advice for a first time guest visiting? Make sure you give yourself enough time to thoroughly enjoy not only all that I have to offer, but everything the beautiful resort and this wonderful city has available at its finger tips! It will take you hours just to explore all the majestic works of art that that adorn my walls. Then, the glow of the Miami sun will reel you in and you’ll step outside onto my expansive oceanfront terrace, where trust me you’ll want to have your bathing suit ready. A quick nap on one of my sun loungers and a refreshing dip in my private pool will give you that Miami vacation vibe you’re longing for. From here, the private Butler will be awaiting any special requests or desires you may have. Dinner reservations, entrance to the most popular events in Miami, sport or theater tickets, whatever you fancy, my Butler holds the keys to the city and will ensure your stay becomes an experience you’ll never forget. Click here to learn more about Acqualina Resort & Spa on the Beach and the Valerie Wilson Travel Suite Access™ benefits available to you.